1. What Parade Hosted in Philadelphia is the Oldest and Longest Running in the United States? Started in 1920, the Philadelphia parade is billed as the oldest Thanksgiving Day parade in the country. Like other parades of its type, it features balloons, floats, high school marching bands, and celebrities. The first Thanksgiving Day parade held in 1920 was sponsored by Gimbels department store. When the parade was begun, it was called the Gimbels Thanksgiving Day Parade. Ellis Gimbel, one of the founders of Gimbels Department Stores, wanted his toyland to be the destination of holiday shoppers everywhere. He had more than 50 store employees dressed in costume and sent to walk in their first Thanksgiving Day parade. The parade featured floats and marchers paraded down Market Street, with the finale consisting of Santa Claus arriving at the eight floor toy department at Gimbels by climbing the ladder of a Philadelphia Fire Department ladder truck. 2. What is the population of Philadelphia? The 2015 Census Bureau estimate of Philadelphia's population was 1,567,442. It is the fifth largest city in the country. 3. Why is Philadelphia called the City of Brotherly Love? "Philadelphia" is a combination of two Greek words: love (phileo) and brother (adelphos). The city was named by its founder, William Penn, who envisioned a city of religious tolerance where no one would be persecuted. Penn also hoped to live at peace with the native Americans and paid them fairly for the rights to the city's land. 4. What early role did Philadelphia play in the fight for human rights? Philadelphia was the birthplace of the abolition movement. On February 18, 1688, Quakers in Germantown protested "traffic of Men-body." In 1775, Quaker activist, Anthony Benezet, called the first meeting of the nation's first antislavery organization, the Pennsylvania Society for Promoting the Abolition of Slavery, and the Relief of Free Negroes. In 1787 Benjamin Franklin and Benjamin Rush joined the group and helped write its constitution. Franklin became its president and, in 1790, petitioned the U.S. congress to ban slavery. 5. When was Philadelphia founded? The city of Philadelphia was designed by William Penn (1644-1718) and first settled in 1681. Penn envisioned "a greene Country Towne, which will never be burnt, and allways be wholesome" that would prosper peacefully alongside native inhabitants and where all religions would be accepted. 6. How big is Philadelphia? The 1854 Act of Consolidation expanded the city from 2 square miles to its current size of 129.714 square miles. 7. In what county is the city of Philadelphia? The city of Philadelphia is in the county of Philadelphia. The County of Philadelphia and the City of Philadelphia have the same boundaries. Source: Philadelphia Bulletin Almanac, 1976, p.68. 8. What is the latitude and longitude of Philadelphia? The latitude of Philadelphia is 39 Degrees 57.08" N. The longitude is 75 Degrees 09.49" W. The elevation above sea level is 131 ft (40 meters). 9. Why is Philadelphia called a "greene country towne"? It is from William Penn's "Initial Plans for Philadelphia." It reads "Let every house be placed...so there may be ground on each side...that it may be a greene country town." Penn wished to improve upon the crowded condition of London by designing a city with houses set on large lots along wide streets to limit the spread of disease and fire. 10. What religious denomination predominated in Philadelphia in the years after its founding? No religion predominated. William Penn advertised the city as being tolerant of all religions and consequently it attracted Quakers, Lutherans, Anglicans, Presbyterians, and Baptists. 11. When did Philadelphia officially become a city? William Penn signed the Charter of the City of Philadelphia on October 25, 1701. 12. When was Philadelphia the primary port for immigrants coming to America? 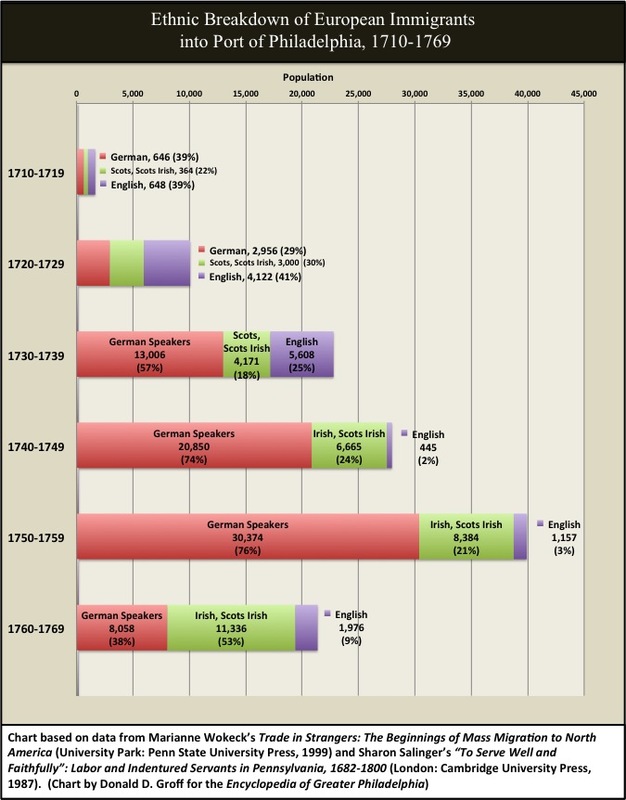 From the 1720s until New York surpassed it in the early nineteenth century, Philadelphia was the city that received the most immigrants in America. New World opportunity and wars and persecution at home sent thousands of people from central Europe and Northern Ireland to Philadelphia and the surrounding region. By 1770 records show that close to 76000 Germans, 34000 Scots and Irish, and 14000 English immigrants had entered the port of Philadelphia. 13. What is Philadelphia's motto? The motto, known as the Philadelphia Maneto, is "Caritas fraternitatis maneat in vobis," Hebrews XIII.v.1. Translated, it means "Let brotherly love abide with you." Source: Finkel, Kenneth. Philadelphia Almanac and Citizen's Manual. Philadelphia: Library Company of Philadelphia, 1995. p. 145. 14. What is Philadelphia's official song? "Neighbors in the New World," by Bill Jolly, was commissioned by The Philadelphia Convention and visitors Bureau in 1991 to commemorate the 500th anniversary of Columbus' arrival in the Caribbean. It was dubbed "Philadelphia's new theme song" by Inquirer staff writer, Edward Colimore.